Welcome to this SUPER guide to buying a Windows PC for photo editing that walks you through what you should and should not spend money on in a Windows PC to do photo editing. 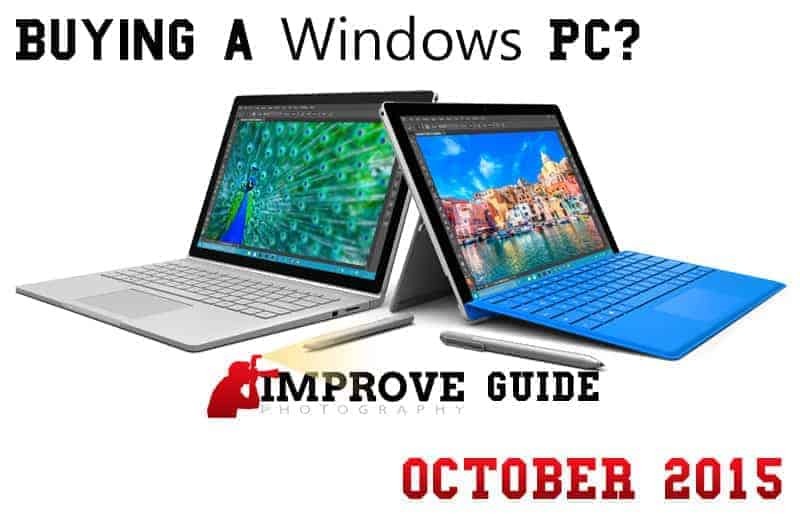 Over the past couple of months I have been hearing from the Improve Photography podcast listeners and readers that they want some help in choosing a Windows PC. Not sure what is bringing on the fresh interest. Maybe photographers are finally settling into editing all of the shots they have taken over the summer. Maybe they have been editing all summer and things have finally slowed down enough that they can focus on getting themselves a new PC so that next year they aren't cursing all the way through their edit sessions. Whatever the reason, I have heard it enough to spend more than 40 hours researching ALL of the options to buy a PC and produce this 20 page, 8,600 word super guide. The guide is intended to educate photographers on the specific computer components that actually make difference for a better photo editing experience. I tell you the things that are worth spending money on, and the things that are not. With that information you should be able to figure out what will be best for you and your specific situation. If you like this guide, you will love my Photo Taco podcast on the Improve Photography network. It is a short-format, 7-10 minute podcast that comes out twice a week with deep dives into specific aspects of photography. This is NOT an article discussing Mac vs. PC. I know a good portion of our audience use and LOOOOOVE Mac, and that's great. You Mac fanboys can keep right on using your lovely Macs. Even though there Apple just quietly updated their iMac lineup with new 6th Generation Intel SkyLake CPUs in October 2015, I am going to keep the scope of this guide to Windows computers. Although the “Import Factors” section applies to Mac just as well as it does for Windows. I do have some more specific Mac information in my article about why I think photographers should skip the last hardware update Apple made in the 2015 MacBook (just MacBook, not MacBook Air or MacBook Pro) and my Mac vs PC article. Plenty has happened in the past few months in the Windows PC world that means my other articles need updating specific to the Windows side of things and here it is. So let's dive in. As you are considering buying a Windows computer, there are many choices you have to make. Choices that as a photographer you aren't likely to really understand, which is why are you reading an article from a self proclaimed super geek like me. So let me outline for you the things I have personally found to be most important in a computer for photo editing. These things are very much listed in order of priority, you should spend your money first on the things in the order of this list. If there is only one thing you take away from this guide this is it – SSD is the single most important thing you can do to make your photo editing experience good. If you read my Mac vs. PC article, you will notice that I have changed my mind on what I think is the most important thing in a photo editing computer. I put RAM as the most important thing to buy in that article written in the first part of 2015. RAM is still really important at number 2 on the list, but I have now personally seen what an SSD does for a computer so many times I am convinced it the single biggest thing I would spend my money on. If the computer you are buying has a choice between a smaller SSD and a larger magnetic drive (HDD), even a 7,200 RPM drive, I would opt for the smaller SSD. The good thing is that as you go out to buy a computer today nearly all of the higher end computers will have an SSD, especially in a laptop computer. If you are looking to buy a Windows laptop and SSD not only offers better performance, it also means a significant increase in battery life. Laptop battery technology hasn't really changed much over the past 10 years, yet many current laptops are advertising between 8 and 12 hours of battery life! Some of that has to do with the nature of the testing that allows those claims, real-world usage is likely to be less than that, but you can definitely get a lot more life out of today's laptops than you did even 3 years ago. The operating systems have focused on doing things to help extend battery life, but one of the single biggest factors that has led to longer battery life is the SSD. They are far more energy efficient than their older, slower, and bigger brother the HDD. So the cost of the SSD over HDD is 1000% worth it. You are now convinced that SSD is the way to go right? Now you have to decide how big that SSD should be? For a photographer I recommend nothing smaller than 256GB. That is enough to install Windows, Photoshop, and Lightroom with enough room left over to hold 1 or 2 photo shoots before you have to move the photos off to another drive (an external drive or something better like direct attached / network attached storage). If you can customize the computer you are ordering I would get the biggest SSD drive your budget will allow being careful to balance the other things on this list. One thing to remember with Windows PCs is that they usually allow you to upgrade components like the hard drive and RAM without too much difficulty. Even if you don't know how to do it yourself, I am sure there is a geek in your life that would be willing to help you out at a very reasonable cost. So if you have to go with a 256GB SSD on the computer now and decide later that you want to put a bigger drive in your computer (or a 16TB SSD becomes something within budget), you can get that done. Or you can buy a magnetic drive now and upgrade it to an SSD after you get it. This is precisely what I have done to 4 of the Windows PCs in my house since early in 2015. Replacing the slow HDD with an SSD has breathed new life into older and cheaper laptops more than I could believe. If any of you readers are interested in a guide from me on how I have done this kind of an upgrade without losing a single byte of data, let me know in the comments or hit me up on Twitter/Facebook. I have recently had some discussions with readers of this website and listeners of our Improve Photography Podcast about the reliability of SSD drives. I am glad we had the discussion so that I could address it in this guide, as drive failure is a primary concern for everyone but photographers perhaps even a little more than most. SSD drives made up of flash technology very similar to those SD cards you put into your camera, and we know they don't last forever. Due to the way flash technology works it can only be written to a limited number of times. Just like any hard drive, eventually the SSD will fail. Question is do SSD drives fail faster than magnetic drives? No, they don't! At least they aren't likely to be any worse, but there are not guarantees on that of course. I love the SSD endurance test that our friends over at TechReport.com did in late 2014 because they took consumer grade SSD drives to their limits on the number of writes they use and were able to show they did far better than expected or even claimed by the manufacturer of the drive. So don't worry about the reliability of SSD being any worse than magnetic drives, but PLEASE make sure you have backup strategy. Check out my article on storage workflow for suggestions on a plan of attack for this. Side Note: Briefly, while on the topic of hard drive reliability, not all magnetic drives are equal in regard to failure rates. For some reason there are specific models within brands that fail more than others. Not a specific brand that fails more than another, a specific model within a brand ends up struggling enough you should avoid them. One of those is the Seagate Barracuda 1.5TB drive. Check out the hard drive reliability reports that cloud storage provider Backblaze provides to see how the different drives they use from all the manufacturers fare. Now back to the topic. Finally, if neither SSD nor hybrid are options, then at least make sure the magnetic drive is 7,200 RPM. If the PC has a 5,400 RPM hard drive, just walk away. If you have spent money on the rest of the components on this list and you have a 5,400 RPM magnetic hard drive in the machine without any kind of SSD acceleration, I promise you will be unhappy editing photos. It isn't likely you can even order that kind of a combination, although laptops still tend to have the slower drives because they consume less power, so make sure you find out before ordering. When most people use the word “memory” when talking about their phone or computer, they are talking about the amount of data you can store and that is actually the first thing I addressed in this guide. Unless you are a geek, RAM is something not quite as visible when you are using your computer day-to-day, but you will know it when you attempt to edit photos on a computer that doesn't have enough of it. As someone with a software development background it pains me to see how much RAM Photoshop and Lightoom gobble up, but I can tell you that it really does help to throw as much RAM as possible at those programs. For several months now I have been doing some testing of how Windows version 8.1 compares with Windows 10 (keep your eyes out for my review on Windows 10 in the coming months right here!) and one of the things I am monitoring closely is how much RAM Photoshop and Lightroom need. My main photo editing computer as of the writing of this article is a custom built Windows desktop PC I put together in 2013 with 32GB of RAM and my testing has shown that in just starting the applications Photoshop and Lightroom both want 1GB of RAM each. That is before doing a single thing in them, no file open in Ps and no actions taken in Lr (other than the default catalog being opened up to where I left off). With both programs configured to use all 32GB of RAM if they want it, after doing a 7 photo HDR merge in Photoshop the RAM jumped up to 4GB. After doing nothing but scrolling through a few hundred photos in Lightroom, the RAM jumped up to 3GB. Therefore, I recommend that in order to get the best performance out of both Adobe programs running you need at least 7GB of RAM just to run them and nothing else. I recommend giving the OS 2GB of RAM, making the total 9GB. If you add a browser running at the same time, and you know you run Chrome all day too, you need to add another 1GB. For the very best performance of running these applications on Windows I think you need 10GB of RAM – a number that isn't found in computers today. You usually have a choice between 8GB and 16GB, so I would choose 16GB. If your budget doesn't allow both a 256GB SSD and 16GB of RAM, I would go 8GB of RAM and 256GB SSD instead of an HDD. If you have to choose between 16GB of RAM or going from a 256GB SSD to a 512GB SSD, I would choose 8GB of RAM and the larger SSD. I would choose 16GB of RAM over 1TB of of SSD, meaning I would back down to 512GB SSD and go up to 16GB of RAM. Why do I prioritize SSD above RAM so much? Because Windows will very easily use your SSD sort of like extra RAM when you run out of it and the SSD is so fast the penalty being paid for that is not too bad. Another reason for this recommendation to get SSD before RAM has to do with battery life if you are investing in a Windows laptop. The more RAM you have in the computer, the more power you need to run the computer – even if all of that RAM isn't being used. Just turning it and letting it sit there your battery will go down faster with 16GB of RAM than it will with 8GB of RAM. So if battery life is pretty important to you, 8GB of RAM may be the most you want to get even if your budget allows for more. I do not recommend anything less than 8GB of RAM if you are going to be doing photo editing on a Windows laptop. Will it work? Yes, but be ready to be watching the hourglass spin. I suppose you might be able to having things go fairly well with only 4GB of RAM if you only run nothing else but Lightroom (including not running a browser). But if you are will be running all 3 applications at once your computer is going to struggle with less than 8GB of RAM installed. If you are going to do a lot of video editing, even 16GB of RAM is likely not enough and I recommend 32GB. In item 4 below, I recommend that you do not buy AMD graphics because Adobe has not done a good job supporting them in Lightroom and Photoshop. Same goes for AMD CPUs, but not to the same degree. Lightroom in particular absolutely struggles with AMD graphics today, but there isn't as big a difference between an Intel CPU and an AMD CPU for running Lightroom and Photoshop. I am convinced that Adobe better supports Intel. Adobe has optimized Lightroom and Photoshop to work best on Intel CPUs. It is enough that I recommend Intel over AMD, but if you find some crazy deal on a computer with all the other stuff on this list and it has an AMD CPU, you may want to go for it. If you are going to do much video editing, this recommendation changes from a slight preference of Intel over AMD to a solid Intel recommendation – Adobe Premiere Pro and After Effects are absolutely built to use Intel. I recommend an Intel “Core-i” CPU. You don't want to try running Lightroom or Photoshop with Intel Pentium or Intel Celeron CPUs. Core-i3, Core-i5, and Core-i7 can all run Lightroom and Photoshop, although if the budget allows you will be happier with Core-i5 and Core-i7 than Core-i3. I put the CPU down this far on the list because I am firmly convinced that you should spend your money on an SSD and RAM before maxing out the CPU, but I think that paying for a Core-i5 CPU is worth the money. In fact, you can check out this awesome guide over at cpubenchmark.net to see their testing results on CPU performance to compare them while shopping. The CPU comes into play when you start using sliders and filters in Lightroom, and when you start adding layers with masking and adjustments (among other things) in Photoshop. Core-i3 will really start to be a bottleneck making Lightroom and Photoshop slow even with an SSD and 16GB of RAM. If you have the budget for it, going all the way to a Core-i7 CPU will be worthwhile. Core-i7 has a lot more power, but it will drain your battery faster. How big is the performance difference? The fabulous cpubenchmark.net gives a common Core-i5 2.7GHz (i5-5257U) processor used in 2015 laptops a CPU Mark score of 4,326. The Core i7 2.8GHz (i7-4980HQ) processor also commonly available as an upgrade in 2015 laptops gets a CPU Mark score of 10,131. The Core-i7 is 2.3x faster than the Core-i5. That is going to be a material difference in how fast Lightroom and Photoshop will run. The same thing is roughly true for desktop computers. However, if battery life is really important to you for a laptop, Core-i5 may be the most you want. Yes, the speed difference is material, but Core-i7 will also make a material difference in how fast your battery will drain. So you will have to make that choice. I just want to say that I don't think you will be completely unhappy with how quickly Lightroom runs with Core-i5. OK, so you have the information you need to decide between Core-i5 and Core-i7. What about the difference between two different versions of the Core-i5? Many Windows laptop makers will allow you to pay some relatively small amount to buy a little bit faster Core-i5 processor, is that something worth doing? If it is in the budget, then maybe, but only if you have already put the SSD and RAM into the computer. Remember, I have very specifically put CPU 3rd on this list. I have looked at the various options being offered in 2015 for CPU upgrades, and you will get at most about 10% more CPU performance out of such an upgrade between the same line of CPU (e.g. two Core-i5). So is 10% more CPU worth $50 or $100 extra? Maybe. I think I would save the money myself, but you'll have to decide how much that %10 is worth to you. Coming in at 4th on the list for a photo editing computer is graphics processing. Honestly, as of the writing of this article, Adobe is struggling to use graphics processing overall. In fact, the current recommendation on all systems is to disable the graphics processing in Lightroom because it is just not ready. In several releases of Lightroom in 2015 there have been significant issues with AMD graphics processing. I expect this to change over time. I think Adobe will get better at using graphics processing and they won't leave AMD out in the cold forever. But that day is not today, and if NVIDIA graphics isn't available in the Windows PC you are looking to buy, DON'T buy it! I don't care what the rest of the configuration is. I don't care how good the price is. Don't buy a Windows PC today with an AMD graphics card if you are going to run Lightroom and Photoshop. OK, so NVIDIA graphics, but many Windows computers let you pick between how much “memory” is available on the graphics card. This is memory dedicated to the CPU different from the RAM in number 2. This is a hard one to make a recommendation. To “future proof” your computer so that it is ready for the future you may want 2GB or 4GB of graphics memory. But honestly neither Photoshop nor Lightroom actually uses that effectively today. Meaning if you opt to pay for 4GB of video memory I don't think you will see any real difference between having only 1GB of video memory – and I don't see that changing soon enough for it to matter. I think your shiny new computer will be in need of replacement before Photoshop and Lightroom reliably use video memory to increase performance. For now I recommend having more video memory be way down on the priority list as you are spending your computer budget. The other reason to keep the video memory smaller has to do with battery life in a Windows laptop. Just like RAM in point number 2 above, the more video memory you have in the laptop, the faster you battery will drain. Since Ps and Lr don't effectively use this type of memory, this is a no-brainer for a laptop, keep it low. One last thing to say here is NVIDIA vs. Intel graphics. Intel has built graphics processing capabilities into their CPUs (next on the list of things to consider) for many years now. The graphics available from the CPU used to be so bad there was no way I would recommend using it, but it has improved so much that I think it is currently a very viable option. Yes, I think a “discrete” (a separate graphics processor from what is on the CPU) NVIDIA graphics card provides better performance today, but not by so much you shouldn't consider Intel graphics. If you are buying a Windows laptop I may even say it would be worth it because the battery is going to last longer with Intel graphics without giving up so much processing power in the current versions of Lightroom and Photoshop for it to be a serious issue. As I mentioned already, I expect this to change as Adobe figures out graphics processing, but it may take long enough for Adobe to figure that out Intel could have enough time to develop their tech that it never ends up making a difference. Time will tell, but my recommendation is NVIDIA for a Windows desktop computer and Intel on a Windows laptop if battery life is very important to you, NVIDIA otherwise. Again, if you plan to edit a lot of video, both AMD and Intel is not enough. Adobe Premiere Pro and After Effects have been using graphics processing for quite some time. At this point both have matured their support of graphics processing much more than Lightroom and they have a clear preference for NVIDIA making it an easy choice for Windows computers to do video editing. These are the little details that can make or break how well your Windows PC does with photo editing. You can have all the rest of the top 4 items already listed, and if you don't have these ports you will not be happy. USB-C is coming. At least I hope it is. There was a quick burst of adoption in the middle of 2015 when Apple, Google, and a few others put this next generation USB port into their products. But it has gone quiet since then, including a surprising lack of USB-C in the latest updates to the Surface line of products from Microsoft in October 2015. Offering faster speeds that USB 3.0 (and a connection that no longer has a right side up!) I expect to see a lot of PC makers put the new port into their 2016 models, and I think it will be very good for photographers. In fact, if you see something that has Thunderbolt 3 support, it will actually be a USB-C connection type. It doesn't mean every USB-C is also Thunderbolt 3, but Intel has decided that the Thunderbolt 3 connection will be the USB-C format. So that's cool, but in 2015 I don't think you will find them in too many of the PCs you may be looking at. If you do, it is a good bet the rest of the machine will be good enough you should get it! Thunderbolt ports are common in Apple computers, with Thunderbolt 2 being the default in anything you would go to buy today. Yet this is not something that is very common in Windows PCs even though Intel is the company that created it (yes, Thunderbolt is not a technology Apple created). There are a couple PCs out there right now that not only include Thunderbolt, it is the very latest version in Thunderbolt 3! Having this port makes it possible to use Direct Attached Storage (DAS) like from Drobo or G-Tech and connect external storage to your computer at speeds fast enough it will feel like it directly inside your PC. USB 3.0 ports are the next closest thing to getting Thunderbolt like performance on your PC. Although technically rated at the same speed as Thunderbolt 1, Not quite as fast in the real-world, it is so much better than USB 2.0 that you can actually edit photos on an external drive connected using USB 3.0. This is one of the things I would recommend you consider to be absolutely critical to buying a Windows PC that is good for photo editing. If the PC you are considering doesn't have at least 1 USB 3.0 port, walk away. By the way, as a quick aside here, if you want to see my recommendation on how to manage your storage, check out my article about storage workflow. Last, let's briefly talk about connecting display (monitor) to your Windows PC. I recommend DisplayPort as being the best way to connect your PC to a display. DVI is a close second, and then HDMI is a more distant 3rd – but still acceptable. With 4K displays coming on (read the next section because I don't think you want it yet), DisplayPort is the only connection type with enough bandwidth to actually use them (today in 2015). DVI-D (has to be dual link, single link has even lower resolution limits) maxes out at WQXGA (2560×1600) and can't support a 4K or higher display. The current HDMI connection on most PCs is version 1.3 or lower and supports a max resolution of 1920×1200 (with a hack) but really maxes out at Full HD (1920×1080), which is why I listed at as the 3rd choice here. HDMI 2.0 changes that, as the new spec maxes out at 4K, but I haven't seen any Windows computers with HDMI 2.0 built in. Still, any of these three types of connections are good to great for photo editing. It is only VGA that is not good enough. If the PC you are looking at has only VGA out for connecting an external display, walk away. Not only is that connection not good enough, it is a good indicator that the rest of the computer is going to struggle to work well editing photos. 4K seems to be all the rage and picking up a lot of momentum, but I am going to tell you right now not to waste your money on it. You would be much better served to spend less on a display and put it on one of the first three things on this list. I think the 4K hype is coming based on what is going on with TVs, but seriously do not spend your money on 4K for a photo editing computer right now. 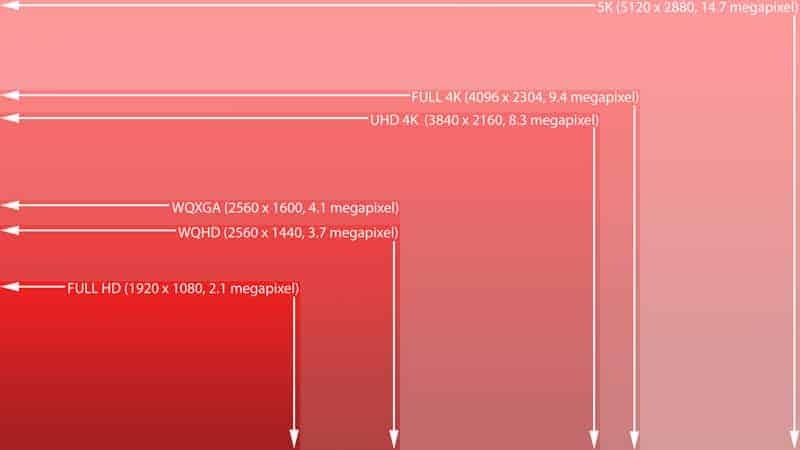 Not sure exactly why it is that the increase in resolution from WQXGA (2560×1600) or WQHD (2560×1440) to Ultra HD 4K (3840×2160), Full 4K (4096×2304), and even 5K (5120×2880) is barely noticeable, but there is so little difference. I promise you will be wasting your money on it right now, at least I think it will be some time before it matters on a Windows photo editing computer. Don't believe me? Check out Jim's video where he had people compare a 27″ iMac with the very good WQHD resolution to the 27″ 5K (5120×2880) iMac. Nobody could tell the difference! So the average non-photographer can't tell, but surely a professional photographer would be able to spot it you are saying. Jim has been a professional photographer for many years and although he fully expected to see a massive difference between the two models of the iMac, he was surprised the he really couldn't. Note: With the refresh Apple did of their iMac in October 2015 they increased the color gamut beyond sRGB to DCI-P3 and this may make it so that there is a bigger difference with 4K and 5K. Personally I think the reason WQHD to 5K couldn't be seen too well between the two iMac computers is that neither OS X nor Adobe Lightroom / Photoshop has actually been designed to take full advantage of all those pixels. The same is true of Windows. In fact, it might be a little worse with Windows because Apple did at least make some tweaks to OS X in order to make the 5K iMac work whereas the high-DPI scaling has so far not been too great on Windows. WQHD and WQXGA are very good, but those resolutions do reduce things down to looking very small. Whatever the reason, I hope you are convinced that you don't need more than WQXGA (2560×1600) for your photo editing needs. While I think you should not invest in 4K right now for photo editing, I have to tell you that the jump between doing photo editing on a Full HD display vs. WQHD / WQXGA is HUGE!!!! As I stated back in that Mac vs. PC article earlier in 2015, when I upgraded from a good Asus Full HD display to one that supports WQXGA from Monoprice (which I have validated works just great with my 2015 13″ MacBook Pro) I was completely shocked at the difference. You remember the first time you saw HD TV compared side-by-side with SD TV? It is that big. If you are doing photo editing on a Full HD display you really should look into upgrading things so that you can get to WQXGA, and I can very highly recommend the 30″ IPS display that does that does WQXGA and has DisplayPort/DVI-D/HDMI from Monoprice for about $560 (just don't hook it up using HDMI which will dumb it down to Full HD)! Where are we with displays now? Don't waste your money on 4K, but you definitely want WQXGA or WQHD. Yep, that's it. Oh, except for laptops. WQXGA is my strong recommendation for a desktop, which includes when you connect your laptop to an external display (which again you should try to do through DisplayPort if possible). However, that is NOT my recommendation for when you may be doing edits on the go using only the screen built into your laptop. For that, I don't think there is significant difference an any resolution higher than Full HD (1920×1080). I also recommend that you don't go any lower than Full HD. As I have been checking out Windows laptops that meet my list of requirements here, they all had at least Full HD screens, so you probably don't have to worry about it a lot. However, there were some that had options to upgrade the screen from Full HD to 4K, and I don't think it is worth it on 13″ or 15″ laptops. In fact, like many of the components in this guide, battery life is significantly impacted by the screen on a laptop. The more pixels packed into the display, the more energy it is going to take to run it. If that screen has more than Full HD not only do I not think you will be able to tell a dramatic difference on screens sizes that small, it will take more of your precious battery life. The final thing to say about displays in general, for both desktops and laptops, is to look for the display having a specific technology called IPS (In-Plane Switching). I won't go into detail about what it is, but it is something very much worth paying for to make your photo editing experience better. With IPS it changes much less based on the angle you are viewing the display, making it so that things look the same if you are sitting up straight or slouching for example. So that is something worth paying more for if you have to choose between IPS and not. 9. Windows 7, 8.1, or 10? If you have been following things on this website or on the Improve Photographer podcast you know that I have been recommending photographers hold off on upgrading to Windows 10. The keyword there is “UPGRADING.” If your computer did not come with Windows 10 installed on it, I recommend that photographers wait to get their free upgrade to Windows 10. That recommendation is not because an upgrade of your current computer to Windows 10 is guaranteed to be a problem, I think it is very likely most of you could do the upgrade and have no issue. But there are enough that have had various problems with the upgrade to avoid doing it for now. I think Microsoft needs a little more time fixing issues to make it so that I feel comfortable saying it is time for photographers to go and get that free upgrade to Windows 10 done. I expect that recommendation to change sometime before the end of 2015, so stay tuned. So, what is my recommendation for photographers buying a new computer today? Windows 10. A computer that comes with Windows 10 installed is going to be great! While you are investing a new computer I think you should get the latest and greatest operating system installed. Frankly, because Windows 8/8.1 was so poorly received, PC makers are doing all they can to make sure your Windows 10 experience is great because they have had some slow down in the industry for a couple of years and can't afford to have that be bad. Although I also don't suggest you dismiss a Windows computer because it has Windows 7 or Windows 8.1 on it. Do I think Photoshop and Lightroom will run better in Windows 10? No. At least not yet. In a year or two Adobe will likely change Photoshop and/or Lightroom to take advantage of Windows 10 so that it runs better, but for now I am guessing it almost doesn't matter which version of Windows you run from 7, to 8.1, to 10. Did you catch that I wrote “almost” doesn't matter? The one place it might make a difference has to do with my number 1 thing that matters on the list above – SSD. Windows 7 was developed and released at a time when SSD drives were so expensive they weren't mainstream. As a result, if you put an SSD in a Windows 7 computer there are some tweaks you have to do to the OS in order to make it work the best it can. Windows 8/8.1 improved that, and Windows 10 knows when you have an SSD in the computer and sets things to work best automatically. Bottom line, so long as the computer doesn't have Windows XP, it doesn't matter which version of Windows your new PC is running and anything you get right now will have a free upgrade to 10 should that become more meaningful. Now that I have gone over the specs and which are important to pay attention to, hopefully you are an educated shopper and can go compare things yourself. Things are constantly changing with the different PC manufacturers, so it is more important you know what to look for than which specific Windows computer to buy. Not only do the PC makers leap-frog each other on the hardware available in a Windows computer, but the customer service seems to go back and forth as well. I have had good experiences with several of them, I have had bad experiences with several of them. Given that any computer that has the hardware specs as outlined above is likely to serve you well, I do want to offer my opinion on what I would look to buy if I was ready to invest in a new Windows computer today. So here are my thoughts as of the writing of this article for a Windows desktop computer and a Windows laptop computer. Unlike my opinion on laptops (see below), I think a Windows desktop is still the best way to run Photoshop and Lightroom to edit photos for the price. You can get a very good computer to do your photo editing for about $1,000. You can do pretty well for less than that as well, but don't expect a $300 Windwos desktop computer to do a good job with Lightroom and Photoshop. Use my list of components above and make sure you put a little bit of money into this computer or I promise you will regret it. But that is me, and that is honestly more computer than you need to have Photoshop and Lightroom run well. I wouldn't recommend anything less if you are going to be doing a lot of video editing (in fact, you'll need to buy a lot more storage). I also understand that building your own computer is not for most of you reading this article. So, I took a quick peek out at the desktop computers available from the biggest PC manufacturers, and here are some options in no particular order (only one option includes monitor). And if I had to buy one for myself, which of these choices would I pick? Because of my history of buying and not liking many of the HP machines over the years I really didn't want it to be an HP, but I have to say after researching the topic for many hours the HP ENVY Phoenix 850q earns today's Author's Choice award for best Windows desktop for photo editing in October 2015. Not only does HP offer more options to configure the computer exactly how you want it, you have the RIGHT configuration available at a very good price. If you don't already have a monitor (consider the 30″ WQXGA IPS Monoprice monitor as a very good option for about $560), then the MSI 24GE 2QE 4K-010US all-in-one Microsoft Signature Edition would be my all-in-one choice to run Windows. To be perfectly honest, I have yet to use a Windows laptop for photo editing that I actually like. Although to be fair, I haven't personally had hands-on experience with any of the laptops I am recommending below, and I have a feeling my mind would be changed by them. Even though I have been a long-time Windows guy, in mid-2015 I finally bit the bullet and spent what I thought was an outrageous amount of money on a 2015 13″ Retina MacBook Pro, and can say that I personally have never seen a Windows laptop work this well. I don't think Mac OS X itself is all that special, but I have never personally seen a Windows laptop battery last as long as the MacBook Pro and I am loving that specific aspect of Apple's laptop computer. 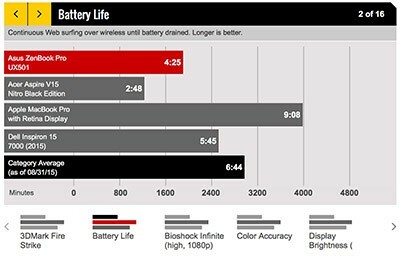 I am not alone on the battery life, laptopmag.com did some real-world testing of the best laptops in 2015 and the MacBook Pro tested as having at least a 3 hour battery life advantage over the rest of the competition. As of the date of this article, before you buy a Windows laptop, I think you should seriously consider a Mac. Yes, it feels overpriced. Yes, it is pretty different from Windows and takes some getting to used to if you have never used OS X. You don't know how much it pains me to write that, but I am serious. If you are in the market for a really good photo editing machine, go spend some time at your local Apple store checking out the MacBook Pro lineup (I think you should skip the MacBook and the MacBook Air). OK, enough Mac love in this 100% Windows computer article. Don't take that lead into this section of the article wrong, it is perfectly fine to use a Windows laptop to edit photos. They are very capable machines, and I suspect that as Windows 10 and computers built specifically for Windows 10 mature Apple is going to have some serious competition on their hands. Still, just like with the Windows desktop, you need to be prepared to spend some money here or I can pretty well guarantee you will have a bad experience editing photos. Based on the pricing I have seen as I researched the Windows laptops that are available as of the writing of this article, you should be ready to spend $1,000-$1,700 or I really think you will regret having invested any other amount in a machine that struggles. Claim up to 12 hours of battery life! If I had to choose a laptop to do photo editing today, I would choose the 13″ Retina MacBook Pro because the battery life is AMAZING yet still has good performance in Lightroom and Photoshop. But this is an article on Windows laptops, so of those listed above I would choose the Dell XPS 13 Non-Touch laptop. I wish it were a bit more customizable. I think I would add 8GB more RAM (you probably can after you get it) to get to 16, and am slightly nervous with the Intel graphics, but not so much that it doesn't get my Author's Choice award for best Windows laptop for photo editing in October 2015. Really it is the Thunderbolt 3 port that has me most intrigued with the Dell models. Many of the other options have more horsepower than the Dell, but their battery life is rated MUCH worse for them. The Dell XPS 13 also has that Thunderbolt 3 port so that you can attach external storage at crazy high speeds. If you plan to do a lot of photo editing on the road, a 13″ screen is pretty small to work on. I don't find it to be good enough for anything but very minor editing, so you'll have to decide for yourself if battery life or another 2″ of screen real-estate is your preference and then I would go with the Dell XPS 15. Lastly, the HP Spectre looks to me like something very close to a MBP, including the battery life. If it had a Thunderbolt port I would have given it the Author's Choice award. But that is a machine I would love to get my hands on to test out and see how it handles Lightroom and Photoshop and how the battery lasts doing so. It is too expensive for the hardware you get. A Surface Pro 4 with 256GB SDD/16GB RAM/6th Gen Intel Core-i5 is $1,500. Going down to 8GB RAM only drops it to $1,300, and you get a TINY 12.3″ screen. The Surface Book is more compelling with a 256GB SSD/16GB RAM/6th Gen Intel Core-i5/NVIDIA graphics but it costs a whopping $1,900! Fully loaded it is nearly $3,000. Man, I thought Apple devices were spendy. That said, the Surface Pro 4 and the Surface Book that Microsoft announced in early October 2015 look VERY good. I am not sure I am quite sold on them yet as being something that would be my recommendation for photo editing, but I really expect that if not this release of the product line that by the 5th revision they will be something that can no longer be ignored for serious photo editing. The specs of the Surface Book in particular are incredible (except for the lack of a USB-C port that I can't understand) and I would love to get my hands on one to take for a test-drive with Lightroom and Photoshop. I think there is a very good chance it will be extremely nice for photo editing, although if the price doesn't go down the cheapskate in me may never allow me to give it my Author's Choice award. If you'd like to hear more of my thoughts specifically on these two newly announced Surface devices, including my geeking out over the specs in detail, check out this Photo Taco episode. Jeff Harmon is a hobbyist photographer living in Herriman, Utah. He has more than 20 years of professional IT experience, most recently as an Information Security professional by day. He does his best to juggle his photography addiction with family, church, and other activities that keep him pretty busy. Be sure to check out his Photo Taco podcast for bite-sized tricks and tips twice a week. You can check out his portfolio at http://jhpics.zenfolio.com. You can also follow him on Twitter and Instagram.